Growing up in Brooklyn during the 70’s we didn’t have all the platforms available that we have now to watch movies whenever we want. The concept of a DVR or Blu-Ray player/disc was considered science fiction back then. So that meant that if there were certain movies we wanted to see, we had to be home to watch them because if we missed them, it would be a whole year before we could see them again. While I do greatly appreciate the convenience of being able to go to my DVD collection or turn on Netflix and see just about any movie I want any time I want, I do kinda miss the anticipation of waiting until the Christmas season to see the Rankin/Bass Christmas specials like “Santa Claus is Comin’ To Town” or “Rudolph The Red Nosed Reindeer” or Halloween to see MAD MONSTER PARTY. Oh, sure…I’m adult enough to wait until the appropriate time to watch ‘em. But I dunno…it’s always in the back of my mind that I can watch them any time I want. Somehow it just seemed more special when I had no choice but to wait to see those specials and this movie we’re going to talk a little about right now. MAD MONSTER PARTY is a stop-motion animated musical spoof of horror movies with an all-star monster cast: Baron von Frankenstein (voiced by Boris Karloff) his Monster, Dracula, The Mummy, The Werewolf, Dr. Jekyll & Mr. Hyde, The Invisible Man, The Creature From The Black Lagoon, The Hunchback of Notre Dame and The Bride of Frankenstein (voiced by Phyllis Diller). Baron Frankenstein intends to retire and leave his castle, his experiments and all his secrets to his nerdy nephew Felix Flanken (voiced by Allen Swift) who sounds uncannily like Jimmy Stewart and even more uncannily resembles Rick Moranis. He calls for a convention of all the monsters to his island in order to announce his decision. This doesn’t go over well with Francesca (voiced by Gale Garnett) who thinks that as Frankenstein’s faithful assistant for years, she should be the successor to Frankenstein. Francesca enlists Dracula and The Bride in a scheme to eliminate Felix and get The Baron’s secrets for themselves. However, that scheme quickly gets scrooched when Francesca falls in love with Felix and is double-crossed by Dracula and The Bride who enlists the rest of the monsters to wipe out Frankenstein, Felix and Francesca and take Frankenstein’s secrets for themselves. There’s a lot of respectable talent in this movie. There’s Mr. Karloff, of course. But Phyllis Diller can get on the last nerve with that trademark, shrill, drawn-out “ha-ha-ha” she feels the need to put on the end of every sentence. Harvey Kurtzman, who co-wrote the screenplay created MAD Magazine and MAD cartoonist Jack Davis designed most of the characters. As can be expected with those guys working on it, there’s a lot of dark humor aimed at adults that goes over the heads of most kids. I was surprised at how many slightly saucy lines and in-jokes I caught when I watched this recently. I was convinced that the movie wouldn’t be the same now that I’m thirty years older than when I last watched it but I was pleasantly surprised at my own enjoyment of the movie. So should you see MAD MONSTER PARTY? Some of you won’t no matter what I say because you’re too sophisticated and would sneer at what you perceive to be crude special effects, out-of-date movie making techniques and would find the movie “corny”. So you can feel free to leave the room. For the rest of you who stayed; if you’re a fan of Tim Burton’s stop-motion work then by all means, give MAD MONSTER PARTY a viewing. It’s a movie where you can plainly see the influences on his own work. And besides, it’s simply a fun little movie whose only purpose to entertain and put a smile on your face for 95 minutes and I can think of no higher recommendation. And for you parents: if you want to expose your kids to a form of animation other than computer generated, here’s a good one. 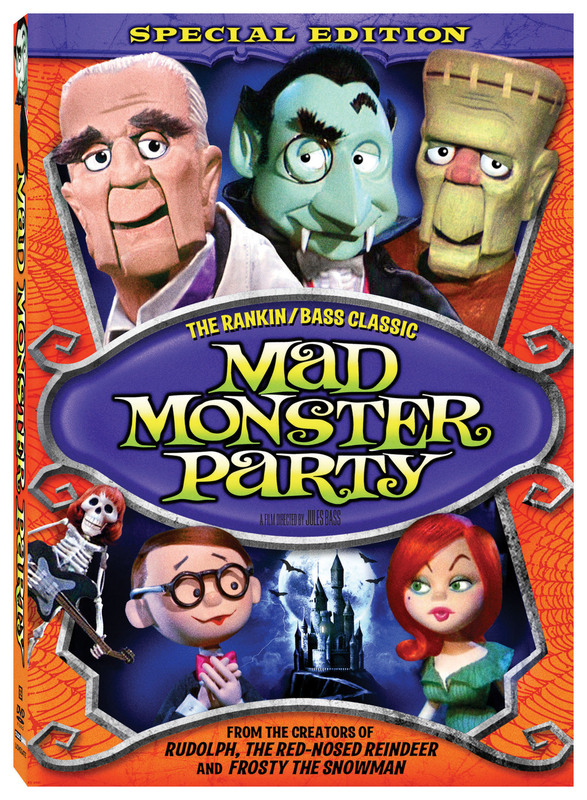 MAD MONSTER PARTY gets my recommendation for family viewing on Halloween. Enjoy.